A 33-year-old man has been seriously injured in a one vehicle crash. 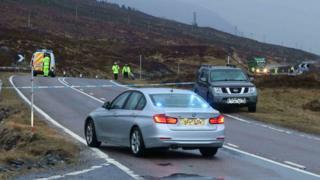 It happened on the A835 at about 17:30. The vehicle left the road and came to rest on rocks over a burn. The road was closed between the village of Garve and the Braemore Junction. Police Scotland said the injured man was taken to Raigmore Hospital in Inverness for treatment to serious injuries. Sgt Donnie Mackinnon said: "Our inquiries are ongoing into this incident and I would urge anyone who may have witnessed the collision or saw the van on the A835 beforehand to come forward. "The road was closed for some time to allow us to carry out an investigation at the scene and I would like to thank everyone affected for their understanding and patience."